I was searching through my letterbox stamp collection when I came across the one for Peterstone Rock Iron Age Hillfort. It is a superb hand-cut stamp made by the Dartmoor Drifter and the name ‘Peterstone’ is an alternative for White Tor which stands by Langstone Moor near Peter Tavy. “Two settlement sites on Dartmoor have been recognised as being potentially Neolithic in date… These sites are situated on the hilltops at White Tor and Dewerstone and are morphologically similar to other sites in the south-west of England which have evidence of Neolithic settlement“. He then goes on to say that the site was excavated in 1898/9 by the Dartmoor Exploration Committee who found a paucity of finds which comprised of a few undatable flints. However there was evidence of rectangular areas of ground clearance which may be associated with similar dwellings that had been excavated at Helman Tor and Carn Brae in Cornwall. There is also the possibility that a nearby small chambered tomb could also be associated with the settlement thus dating it to the Neolithic period. If this is the case then it would make White Tor one of the earliest known settlements on Dartmoor. It should also be mentioned that possibly there is another similar site on Hound Tor which is listed by English Heritage. This reminded me of my last visit to the area where in a small ford below the tor I found a flint fragment (see illustration 2) that although not in context had clearly been washed down from near the tor. The map in illustration 1 shows the landscape of White Tor, its associated prehistoric features and the findspot for the flints. It is clear from the plan that there is plenty of evidence for Bronze Age activity in the form of settlements, reaves, cairns, stone rows, stone circles and menhirs. If the settlement on the top of White Tor is Neolithic it does beg the question as to why in the Bronze Age did the people move off the tor and start building dwellings on its slopes? In addition the question must be asked as to why, if the settlement is Neolithic, did the people need to live on such defendable sites? Was there some pressure being put on resources which necessitated the need to protect them? Many questions few answers. “Most have low, irregular banks, built of weathered granite blocks, often retained by slabs of stone set upright or on edge. Some have narrow entrances, set at relatively frequent intervals, and almost all surround and incorporate tors and smaller natural outcrops of granite. This last trait has earned them the name of ‘tor enclosures’. English Heritage define a tor enclosure as being, “A large hilltop or hillslope enclosure in South West England, located close to rock outcrops, and surrounded by one or more circuits of stone built walls. All are prehistoric; some are definitely Neolithic“. Similarly when discussing the south western tor enclosures Todd, (1987, p.76) considers that all of the examples are located on prominent granite outcrops and usually utilise the natural rock piles in the enclosing walls. The walls tend to be wide and loosely constructed which meant that height wise they were low. He also draws attention to the fact that little excavation has been done on any of the sites and even the 1898/9 excavation at White Tor produced very few finds. In other words the idea that Dartmoor’s two tor enclosures are of a Neolithic date is very much a theoretical one based on evidence from Cornwall. The geographical location of the tor enclosure certainly provides a defensible site which sits at an elevation of 468m. Despite being very exposed there is a good 360º visibility and plenty of water sources within 500m of the enclosure – see illustration 3. “The whole of the summit is surrounded by a double wall in very ruinous condition, and this is to a considerable extent due to the smallness of the stones of which it was composed. The faces of the walls were to be traced only by digging, and were never more than doubtful – illustration 6. Both walls appear to have been 10ft (3.04m) thick, perhaps a little more; the outer, when perfect might have had a height of 4 feet (1.21m), whilst the inner judged by the debris, appears to have been 6 (1.82m) to 7 (2.13m) feet high. The space between the walls varied, owing to the inequalities of the ground, but was generally 10 (3.04m) wide. The circumference is very much broken up, as is also the inclosed area, by considerable masses of protruding rocks. About these, within the camp, heaps of small stones had been piled up, forming cairns. The largest and most notable of these is at the south-west, and consists of a core of rock about which an immense accumulation of stones has been heaped – illustration 5.. All these cairns were thoroughly explored. They covered no internments, and although they disclosed evidence that fires had been lighted against the rocks, and that people had camped there for a while, they showed no tokens of structural erection, as though they were ruinous huts built against the native rock. The huge cairn was removed with great labour, and revealed nothing whatever beneath it but one flint flake. These cairns, there can be little doubt, were collections of stones for the use of the besieged, to serve as missiles, or for the repair of the wall. Within the area of the camp are a few hut circles. One near the centre is double and contained an incredible number of flint chips, a flint scraper, and a core from which flakes had been struck – illustration 7. The whole area is littered with flint chips that are brought up by the moles when making their burrows, and curiously enough not a single arrow-head or flake that can be confidentially set down as a weapon has been disinterred. The pottery found is all of the hand-made cooking-vessel type. To the east is a circle sheltered on one side by a mass of rock, that has a second chamber, a sort of bedroom made under a slab of rock with the interstices on all sides built up, except only on that by which it was entered from the hut. A good deal of flint was found there. Outside on the south, was another hut circle, where a piece of clear quartz crystal was found, together with a flint knife that had one edge serrated by use”. A plan of the early 1898/9 excavations shows much of the above detail and the layout of the enclosure. At this time the current thinking was that there were two sorts of settlements on the moor, the pounds and the two ‘camps’ at White Tor and Dewerstone, both of which were settled by different, “races of man”. What is interesting in this report is that the double hut circle which produced the, “incredible number of flint chips”, could point to a flint knapper’s home and/or work place. The other pieces of evidence which point to a possible Neolithic date are the discovery of a polished stone axe head which was found about a kilometre away at Wedlake and a polished greenstone axe two kilometres away at the Baggator Brook, Butler, (1991, p.92). In addition numerous flints dating to the earlier Mesolithic period have been found to the areas south and east of White Tor. As late as the 1980s Hemery (1983, p.955) was under the impression that the tor enclosure was of Iron Age origin, he clearly states that, “The tor is a wilderness of crags involved in stone walls of an Iron Age fort…“. This is possibly as result of what Paul Pettit wrote in 1974 when he stated on page 179 that, “The only other Iron Age fort on Dartmoor is at White Tor (Tavy)“. He even assigns a construction date of the first century AD and suggests it was built as a tribal stronghold. Both these comments seem a little strange as the finds of the 1898/9 were available to both authors and the very mention of flint scatters should have pointed to an earlier date. If there are very few signs of an wholesale occupation what was the enclosure used for? Oswald et al. consider that tor enclosures are akin to another Neolithic feature known as a causewayed enclosure. Normally these features are associated with banks and segmented ditches of which tor enclosures show no sign. However there are other points of similarity at White tor such as the defining multiple, concentric circuit, (pp. 85 – 86). This being the case then perhaps the tor enclosures were used for the same purposes as the causewayed camps. Basically this would mean that they were used for ritual, feasting, exchange, manufacturing and funerary ritual. Other causewayed camps have show evidence of all the above but the very fact that White Tor lies on peat would mean that a lot of the evidence for such activities would have degraded due to the acidity of the soil. “… they (causewayed enclosures) were arenas for which allowed the scattered population to gather and conduct ongoing projects which demanded and gave focus to their gatherings … people carried out the whole spectrum of different activities that such meetings permitted… and may represent the first detectable evidence for the interaction of larger communities“. Another interesting point comes from Fleming (1988, p.105) who points out that at White Tor there are cross-ridge reaves which may some of the earliest of their kind on Dartmoor. The reaves were prehistoric boundaries which demarcated tribal lands and field systems. 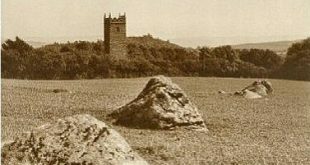 The very fact that some of the earliest reaves are to be found around White Tor may indicate that this is where the practice began? In which case the people living in this area would seem to be very well socially organised and dare one say innovative? So there ’tis, if, if, if, if, until the day someone stumps up some cash for a proper archaeological investigation nobody will ever know the true story of White Tor. What is certain is that if you are looking for an interesting bimble across the moor you could do far worse than getting up to White Tor. Not only can you see the tor enclosure but there are numerous Bronze Age features that haven’t even been discussed here but there are some breath taking views. The walk also passes the legendary Stephen’s Grave and also if you keep your eyes open you make be lucky to find a flint flake or two – anything more spectacular should be reported to the local PAS officer. Baring-Gold, S. 1982 A Book of Dartmoor, Wildwood House Pub., London. Butler, J. 1991 Dartmoor Atlas of Antiquities – Vol. II, Devon Books, Exeter. Fleming, A. 1988 The Dartmoor Reaves, Batsford, London. Gerrard, S. 1997 Dartmoor, Batsford/English Heritage, London. Oswald, A., Dyer, C. & Barber, M. 2001 The Creation of Monuments, English Heritage, Swindon. Pettit, P. 1974 Prehistoric Dartmoor, David & Charles, Newton Abbot. Todd, M. 1987 The South-West to AD 1000, Longman, London. Hi Tim I have been reading your articles and subscibed to the web site but I find the new layout not as good as before. I was looking at White Tor and cannot see how to pull up the illustrations. Hi John, Transferring some 8oo pages from the old site over to the new site was a huge task and unfortunately some of the pages had lost their illustrations. I did check the pages once they were moved over but again this was a very time consuming job – clearly this page was overlooked. I have no amended the page to show the illustrations.